Tag Archive | "fiscal cliff"
Critical Analysis: A Fiscal Cliff Leading to Where? Midnight, January first marks the twilight hour for Americans who have been holding their breath before taking the plunge that is the fiscal cliff. This cliff was meant to serve as a deterrent for Republicans and Democrats to reach a mutual compromise and avoid immediate spending cuts and tax hikes. However, both sides refused to work together until New Year’s Day when they were finally able to pass legislation with a House vote of 257 in favor and 167 against. This legislation responded to concerns about tax hike but delayed talks on spending cuts for another two months. In his White House remarks following the Bill’s passage, President Barack Obama was happy to announce that he “will sign a law that raises the taxes on the wealthiest of Americans . . . while preventing a middle-class tax hike.” But, with an increased tax rate on individuals who earn over $400,000 and households that bring in over $450,000, where do these increases end? And you thought your taxes were high. In France, President Francois Hollande’s – at least temporary – solution to his country’s budget problem is also to tax the wealthiest French, like Obama is doing in the United States. Hollande’s proposal is to hike up taxes to a staggering 75% for those who make over €1 million and a comparatively small, yet still startling number of 45% for those who make over €150,000. However, despite these seemingly outrageous increases, this plan is only expected to save around €30billion, which would only lower the French deficit from 4.5% of national output this year to 3% next year. Not to mention that this plan is only predicted to raise around €500 million: a modest sum for such a shocking tax. And like the United States, France is also crippled by record unemployment and fears of economic stagnation. People are worried that the French government’s harsh tax rates will block innovation and force the super wealthy to move elsewhere. 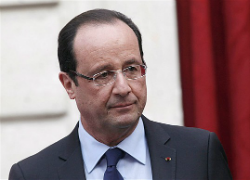 On December 29, 2012, the French President’s 75% tax rate was struck down as unconstitutional. Mr. Hollande himself even acknowledged that the “75 percent rate was always a symbolic political gesture,” as it was set to expire in a few years and as currently written would only affect a few thousand taxpayers. Additionally, the estimated modest tax revenues were not expected to solve any of France’s major monetary problems, and would act as “little more than a bucket of water in France’s deficit sea,” which reached around €85 billion this year alone. The tax was ruled unconstitutional because it “applied unevenly to different households with the same combined income.” For example, a household with a combined income of €1.7 million would be exempt from the tax so long as no one individual made over €1 million. Once an individual earns over the €1 million benchmark, the entire household is taxed 75% on their combined income. Building on concerns that the tax would force wealthy French citizens to leave the country in pursuit of a new home country that would not so severely tax their earnings, estimates have come out reporting that at least 5,000 wealthy citizens would plan on leaving France if the tax was passed. Award winning French actor Gérard Depardieu is rumored to be one of those packing his bags Belgium, where the maximum tax rate is only 50% of income. But for now, the 75% tax hike is invalidated but the 45% tax rate for those making over €150,000 remains in play. Even after the invalidation of his high tax plan, the French Socialist President remains adamant about keeping the spirit of the tax alive and maintains that France “will still ask more of those who have the most.” One political consultant observed that “[g]iving up the 75 percent tax without a fight would be an admission of weakness.” However, others remain skeptical of the tax and argue that going forward with Hollande’s plan, even in a modified form, would amount “to turning France into Cuba without the sunshine.” It seems that Hollande, like Obama, metaphorically remains between a rock and a hard place when it comes to taxes and the right path to take moving forward. After reaching a compromise to temporarily stall the fall over the fiscal cliff, Americans are left wondering where they are to go from here? Is a super high tax increase, like the one in France, in their future? Or is there a better path to take? For now, the answer remains unclear. But one thing is for certain: Americans and the French must both be able to repay their current debts to the international community. Constantly increasing tax rates on the wealthy, however, creates disincentives for people to work hard. And people working hard to earn more and therefore spend more money would add to overall revenue in the future. If simply raising taxes every few years continues to be the trend, citizens might start evading taxes, like in Italy, or decide to work significantly less and force other people to pick up the slack. While one can certainly argue the merits of raising taxes in certain instances, it becomes harder during economic recessions. This disheartening future, where people work less and get paid less, would certainly prove disastrous for governments if tax evasion becomes a desirable alternative for citizens. For now, both the Americans and the French need to keep their eyes to the future and not confuse short-term gains with long-term sustainable reform. Mara Essick is a 2L at the University of Denver Sturm College of Law and a Staff Editor on the Denver Journal of International and Policy. Amidst the Presidential election turmoil in the United States, there was another type of turmoil in Mexico City this past weekend, where the Finance Ministers of the G20 met to discuss the world’s economy and how to address the current financial challenges. Topics at the meeting included Japan’s currency issues, the U.S. “fiscal cliff,” and the European Union’s tensions between promoting job growth and austerity. Meanwhile, German Finance Minister Wolfgang Schaeuble continued to insist that Greece and other weaker members of the euro zone swallow austerity medicine even as their economies sink deeper into recession. Greek Prime Minister Antonis Samaras warns that if parliament does not approve a new round of austerity measures, Greece could be forced out of the euro. Despite the urgency of these economic issues, little progress was made at the G20 meeting last weekend. The lack of progress may have been due not only to differing opinions, but also from fatigue from meeting just a couple of weeks earlier at the IMF’s annual meetings, and the absences of some significant players, such as U.S. Treasury Secretary Tim Geithner and European Central Bank president, Mario Draghi. 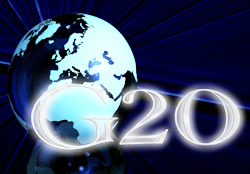 There may be one step forward from the meeting, however, as the Financial Stability board has requested the endorsement of the G20 Finance Ministers for the draft Charter for the Regulatory Oversight Committee of the Global LEI System. Part of the mission of the Financial Stability Board is to “coordinate at the international level the work of national financial authorities and international standard setting bodies and to develop and promote the implementation of effective regulatory, supervisory and other financial sector policies.” Under the proposed Charter, the Regulatory Oversight Committee would be responsible for governance of the Global Legal Entity Identifier System, which provides identifying information on legal entities who are parties to financial transactions throughout the world, hopefully creating more stability and transparency in the global economy. Although this may be a small step for a big problem, possibly getting an endorsement by the G20 and FSB for the Regulatory Oversight Committee Charter could be the one tangible step forward that came from this G20 meeting. Katelin Knox is a 2L and a staff editor on the Denver Journal of International Law and Policy.